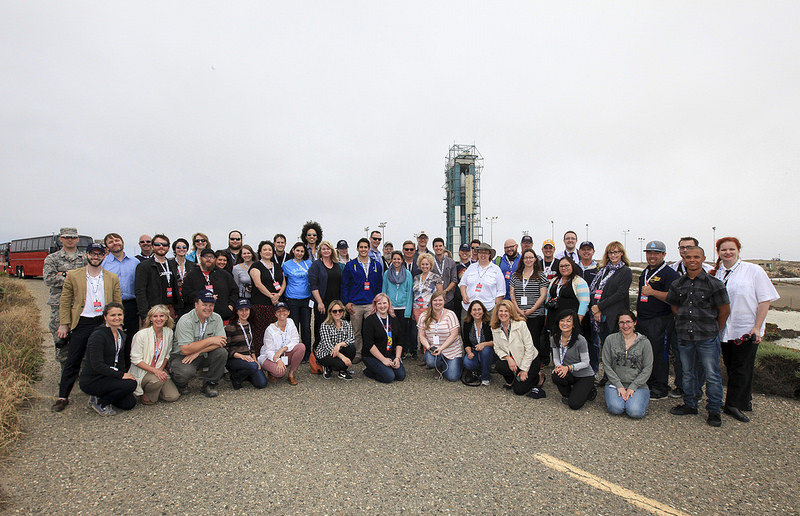 Early in the morning on July 2, 2014, the Orbiting Carbon Observatory-2 was launched into space from Vandenberg AFB on a Delta-II rocket. It made its 30-second launch window, achieved separation, went into polar orbit, and deployed its solar arrays. And I got to be there, or pretty close anyway. The satellite’s mission over the next two years will be to study Earth’s carbon cycle–watching Earth breathe! This year alone NASA will send five Earth based satellites into orbit to study our planet. To learn more about these missions click here: http://www.nasa.gov/content/overview-a-big-year-for-nasa-earth-science/#.U7Q5k2hQnVG or follow #EarthRightNow, #OCO2, & @RobinEggWrites on Twitter. To celebrate my viewing of the #OCO2 launch I put together a list of some of my favorite recent nonfiction picture books that call young readers to look UP into space… and keep them thinking down to EARTH! Check out my video of the titles: THE HOUSE IN THE NIGHT, THE EARTH BOOK (Todd Parr will be sending the winner a SIGNED copy! ), STARS, LOOK UP, & MOONSHOT. If you or your library would like to enter to win one of the featured titles just post your favorite Earth or Aerospace fact in the comments down below, and go ahead and let me know which title you are interested in! I’ll pick the winners on Friday, July 18th! I’ll go first! When the orbiting carbon observatory orbits the earth it will be going 17,000 miles per hour!! Only 3% of the water on the earth is fresh and 97% is salted. Of the 3% fresh water, over 2% is frozen in ice sheets and glaciers. Less than 1% of the fresh water is found in lakes, rivers and underground. Living on Lake Ontario makes us very appreciative of our fresh water! We would be interested in the book Stars or The House in the Night. However, any book you would donate to the bookmobile would be appreciated!! One mature tree can produce enough oxygen for up to 18 people, depending on the size and type of tree. I’ve always found it interesting that the moon is in synchronous orbit of the Earth, so we always see the same side, and never the other. It would be great to put any of those lovely books in the Chelsea, MI Little Free Library! Congratulations, Anari–I pulled your name for the second copy of THE EARTH BOOK! (Because Todd Parr donated a signed book and I had already bought an extra, I get to give away two–woo hoo! Just send along your mailing address to robin@blueeggbooks.com and I will send the book and a NASA sticker along to you. Whoa! I researched all of the books and this is a spot-on collection to inspire young readers to LOOK UP! We’d love to add “The House in the Night” or “Stars” to the Little Free Library #1958. However, like others stated before me, any of these would be great! Whoops – I got excited and forgot to submit my fun fact! The energy released by the three Space Shuttle main engines is equivalent to the output of 23 Hoover Dams. I think this is so vitally important because space travel will help us solve our problems right here on earth. We solve problems through exploration when we don’t even know exactly what answers we are looking for. I love your ‘fact’ Susan 🙂 One of the most amazing things about going to Vandenberg for the launch was hearing Charlie Bolden, former astronaut and current NASA Administrator, speak. I tweeted a bunch of clips from his talk (I’m @RobinEggWrites), given right in front of the launch pad of Space Launch Complex 2. He was quite convincing! I consider myself VERY risk averse (no jumping out of airplanes for me), but MAN he made a good case for manned space flight and I’m kind of disappointed I can’t go! English majors don’t get to be astronauts… but they do get to give away great books! Good luck! More and more people need to be advocates of space exploration. We can be so short sighted so it’s wonderful to hear of your experience! I’m jealous! Congratulations, Susan–I pulled your name for MOONSHOT! Earth is the only planet whose English name does not derive from Greek or Roman mythology. Any of the books would be a great addition to our LFL. Thank you! The International Space Station is the most expensive object ever built. $150 billion! Congratulations, Adriana–I pulled your name for STARS! “If the sun were hollow, a million Earths would fit inside. Any one of these books would be a fabulous addition to Rosemore Park Little Free Library! Congratulations, Jodi–I pulled your name for THE HOUSE IN THE NIGHT! Thanks for giving away books! And I completely agree with Susan. We have to keep exploring space, whatever it takes. It’s vital to understanding our world and to surviving into the future, for the long term. I watched one of the final Space Shuttle launches from a NASA viewing area at Cape Canaveral. What an amazing sight! I’m so glad I had the opportunity. And here’s a fact: The Earth’s rotation is slowing down! It’s not by much, though: the planet is decelerating by an average of 17 milliseconds per hundred years. That means that our days are actually getting longer, though by such a teensy amount that it will take another 140 million years before the length of a day will have increased to 25 hours. As for the books, my Little Free Library would especially love a copy of Moonshot or Look Up. Congratulations, Cathy–I pulled your name for LOOK UP! Here is our Earth fact. The Earth is the only planet that is not named after a god. Roman gods or goddesses names were used for the other seven planets in the solar system and were named during ancient times since they could be seen with the naked eye. They are Mercury, Venus, Mars, Jupiter and Saturn. The Roman method of naming planets was used when Uranus and Neptune were discovered. Our Little Free Library is new to us and our community as well. I am working on getting the word out and hope to see more placed throughout the community and surrounding area. I started a Facebook page Yankton Little Free Library to help people find us and others in the community. If we are lucky enough to be chosen, we would love Stars or Earth or Moonshot or Look Up. They are all great books! If you don’t win one of the July Sky titles (and even if you do) you can always come back to the Nonfiction Nook and enter to win other titles (I just posted a giveaway for an amazing color concept book, GREEN IS A CHILE PEPPER: https://thenonfictionnook.com/2014/07/11/illustrator-interview-john-parra/). I love the work you little free librarians are doing–keep it up! Congratulations, Miguelito Elementary (and Aubrey)–I pulled your name for the SIGNED copy of THE EARTH BOOK! Just send along your mailing address to robin@blueeggbooks.com and I will send it on to Todd Parr, who generously donated one of his books for the giveaway! He will be sending your library a signed copy and I will be sending you a sticker! Our planet is the only one with liquid water on it and it makes summertime so much fun! Thanks for playing everyone — I always love reading your facts! It’s so fun to give books away. I’m just sorry that I can’t give one to everyone. Please remember you can always come back to the Nonfiction Nook and try again! Thank you for doing the book giveaway. It was fun to win, but it was also fun to read what everyone had to say. It’s a great idea. Thanks, Susan 🙂 That’s one of my favorite things about the giveaways too!